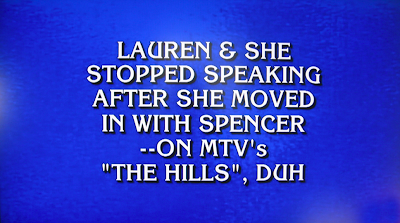 You would assume that a show that thinks as highly of its intellect as Jeopardy does, would employ someone smart enough to know the difference between a quotation mark and inch mark. Surely someone on that staff graduated with a degree in Journalism and owns a copy of The Chicago Manual of Style...I’m just sayin’. And I've always preferred the comma to be inside the quotes ("The Hills," duh versus "The Hills", duh) but I guess it can go either way.